The Amernet String Quartet, which has garnered recognition as one of today’s exceptional string quartets, visited Stetson University’s School of Music to teach students on Monday and will perform Tuesday night, Nov. 15, in Lee Chapel. 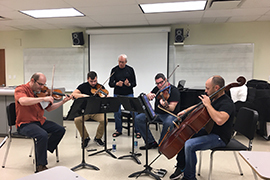 The quartet, currently Ensemble-in-Residence at Florida International University in Miami, gave individual cello and viola lessons to students on Monday, and will work with student composers and teach more master classes on Tuesday, said Manuel de Murga, III, Ph.D., associate professor of music for Stetson’s School of Music. The Amernet String Quartet practices Monday with Sydney Hodkinson, Stetson adjunct professor of music and a composer. Then, on Tuesday night from 7:30 p.m. to 9 p.m., they will perform music composed by Stetson faculty, including Sydney Hodkinson and de Murga. They also will play String Quartet No. 5 by two-time Pulitzer Prize winning composer Elliott Carter. The performance in Lee Chapel in Elizabeth Hall is free and open to the public. The Amernet String Quartet was founded in 1992 at The Juilliard School. The group — Misha Vitenson on violin; Michael Klotz on viola; Jason Calloway on cello; and second violinist this season, Franz Felkl – have performed around the world in Asia, Europe, the Middle East and the Americas, according to their website. Klotz said he once worked with Hodkinson at the Eastman School of Music at the University of Rochester in New York. Hodkinson, Ph.D., is an adjunct professor of music at Stetson, having retired from the Eastman School in 1999 and teaching at many universities, including the University of Virginia, Ohio and Michigan, and Duke. He has written more than 280 works, including seven quartets, one of which Amernet will perform Tuesday night. The Amernet String Quartet will perform in Lee Chapel at Stetson University on Tuesday night, Nov. 15. They are, from left to right, Jason Calloway, Misha Vitenson, Michael Klotz and Franz Felkl. Photo courtesy of Amernet. “For many years, I knew that Syd was living up here and affiliated with Stetson, and I always admired his music and wanted to work more with him, so I proposed we play some of his quartets,” Klotz said. “It’s a lovely campus – a beautiful place,” Klotz added about his first visit to Stetson’s DeLand campus. On Tuesday, the Amernet musicians will work again with students in Stetson’s School of Music, including Maggie Nicks, a senior composition major and a vocalist. On Tuesday morning, they will read through one of her compositions.